When we moved out a year ago, we had pretty much all the 'kitchen essentials'. Being the organised Type-A that I am, I had been collecting kitchen items such a pans, knives, tea towel etc when they went on sale for quite some time, because I knew in the imminent future I would be moving out. When we decided to buy, I curated infinite lists on my phone for each room in the house with what we would need. Slowly they were ticked off, each list diminishing, bar one. The pantry items. This list was seriously stressing me out, because I knew it was insane to want to pack up packets and tins when it wasn't necessary, but I also knew there was no way we would be able to stock the cupboards when we initially moved in. Thankfully, my kind mother helped us out and took us on a supermarket spree buying every single item on that list. Without this gift, we would have had a bare pantry for week, I'm sure of it. Therefore, I thought writing a list of the pantry essentials would be useful for all of you who are planning on moving out soon, or want to get a heads up for when you eventually do. This list can work for living-on-your-own newbies as well as uni students and those of you who never have what you need when you need it! This pantry is nowhere near how I'd like it to be, but its working for now until I can get to IKEA for some storage solutions. Outside of this cupboard there are things like potatoes, eggs, olive oils and bread. I always have those three on hand, but they're just too big for this main pantry cupboard. So, without further ado, lets get into the basics! This may not be basics for a lot of people, but I like to know I always have these items incase the need for an emergency cookie batch arises or I realise I have no bread! With these items you can make things such as savoury and sweet breads, cupcakes, cookies, pie crusts and pastry in general. From this area, you have the sauces for pizza, spaghetti, lasagna. You have tuna for salads and sandwiches, or fishcakes! All the beans are an excellent source of protein, especially if the bill is tight and you can't always afford hunks of meat. The coconut milk is a great substitute for dairy based products or as a sweet thickener, and goes great in soups! The canned chicken soup is for Samuel, who craves that salty goop like nobody's business! All the grains and carbohydrates that get used in cooking go in this area, so I can see at a glance what can go with what dishes when I'm meal prepping on a Sunday (would you like a whole post on meal preps?!). The majority of these are self explanatory, but the surplus of grains is because we like to mix it up! Salads are great bulked out with bulgar wheat, or even using quinoa instead of rice in burritos. The popcorn kernels are there for movie night, and the chia seeds for smoothies and as egg substitute when we don't realise our morning weekend scramble egg used them all up. I wouldn't say they are all basics, but its good to have a variety of grains to enable you to control what you're eating and not live off marinara sauce and pasta! The spreads are excellent on toast or as baking ingredients, the hot chocolate is naturally for hot cocoa and impromptu brownies and the vinegar doesn't have another home...go figure. 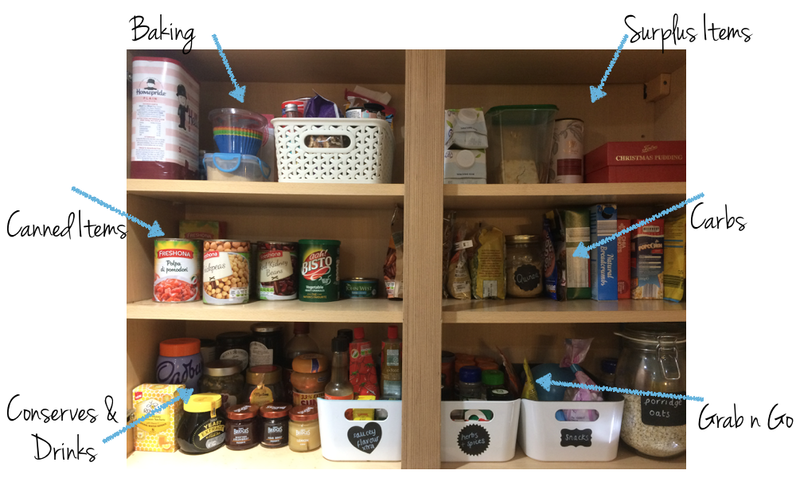 I personally think all cupboards should have elements to make any food taste awesome, and therefore I focussed my initial shop heavily on those items. If we were going to be eating chicken for three days straight, I needed ways to make it taste amazing and not bore us to tears. On top of this, there are also 'basic' items in our freezer such as frozen quorn mince, margarita pizza, frozen veg and fruit. So there you have it. My new home, empty cupboards list. What did you think? Did I miss anything off? What couldn't you live without? Let me know in the comments below!